If you need more than the five concurrent user licenses that come with Titanium Schedule, you can order additional licenses in 5-user increments. Titanium Schedule is very easy to learn, but your staff will need to get up to speed as quickly as possible, and that takes assistance. Videos: Titanium Schedule customers have free 24/7 access to our comprehensive suite of training videos. We provide two groups of videos: one for your staff member who will custom configure Titanium Schedule for use at your facility, and one group of instructional videos to teach your entire staff how to use our software. Onboard: In addition to these videos, the Titanium Schedule program has extensive internal help and access to electronic user and administrator manuals. Our team works hard to keep our videos, help, and manuals up-to-date with all the latest Titanium Schedule features. Support: This is not a case of simply throwing e-training at you and hoping for the best. Our instructional videos are backed up by unlimited user support for your center staff at no additional charge. Titanium’s approach to training has proven cost effective and efficient for our customers. Live Training: Most of our customers find the free training videos adequate to their needs, but we also offer live training. Live training is conducted via web meeting and is available at preset dates and times once a month. Sessions are two hours long, and the pricing below is per connection to the web meeting. The most economical approach is to order one connection and have your staff gather around a single computer and speakerphone. Select the Order menu option above and fill out the order form. After placing your order, you will receive an automatic confirmation e-mail. Attached to that e-mail will be a copy of the Titanium License Agreement for you to sign and return by fax or e-mail. Upon receipt, we will fill-in the fields like license number, add our signature to the license agreement, and return a copy to you for your records. If you order the optional DSM-5 codes, the automatic confirmation e-mail will also have a copy of the DSM-5 User Agreement attached. As with the Titanium License Agreement mentioned above, you must sign and return the DSM-5 User Agreement before we can send you the activation code for this feature. You only need to sign and return this document if you order the optional DSM-5 codes. 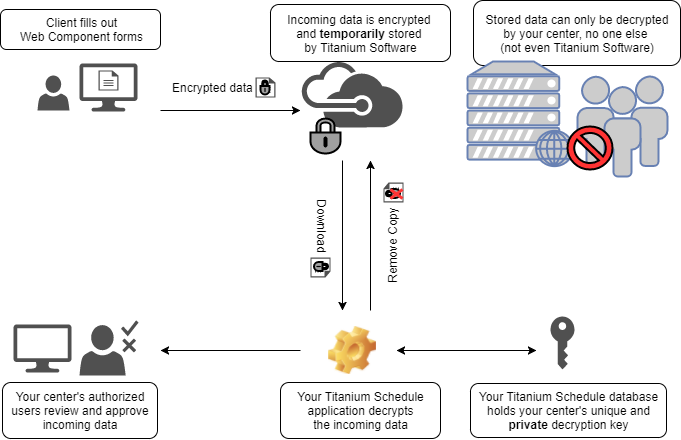 Within one business day after receiving an order and signed Titanium License Agreement from you, we will e-mail you instructions on how to download and install Titanium Schedule. Titanium Software, Inc. will e-mail you an invoice based on your order, which can be paid by credit card or check/purchase order. We do not require payment before sending you our software, but we must have a signed license agreement before we can fulfill your order. Titanium offers flexible payment options. We can split invoices as needed. No payment will be taken at the time of your order. After you complete your order, we will send you an invoice that you can pay by credit card or use as the basis for a purchase order. Our team will be happy to answer your questions about features, pricing and technical matters. Visa and MasterCard are registered trademarks of their respective companies.